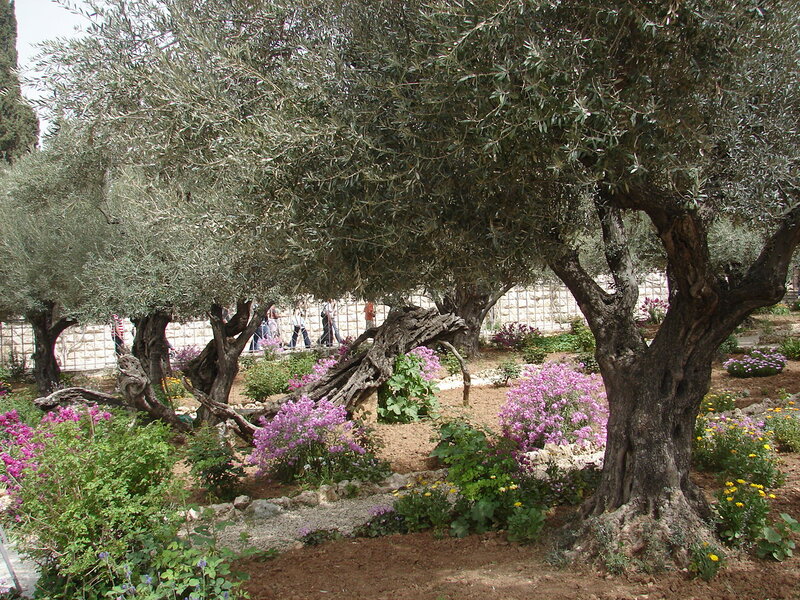 Olive trees (Olea europaea) in the Garden of Gethsemene, Jerusalem. A couple of years ago I was in a sumptuous private garden outside of San Francisco. The Mediterranean style garden was filled with gorgeous silvery trees bearing strange deep purple fruit. When I earnestly praised the trees to the garden’s owner, he looked surprised and informed me that they were olive trees. I was raised thinking olives were disgusting squishy things that came in jars. Only after moving to New York did I realize how varied and delicious they can be. I ran to the nearest tree and pulled off a ripe black olive and popped it into my mouth…and promptly involuntarily spat it out. The fruit was indescribably bitter and vile. “Oh there’s a process to preparing them for eating,” said the owner nonchalantly. That was my first experience with a living olive tree (Olea europaea), one of the plants which appears most frequently in Western literature and art. In Greek, Roman, and Biblical writings, the olive has easy primacy over all of the other plants, fruits, trees and flowers (other than the life-giving grains). It is a defining symbol of Mediterranean culture and civilization. There is a classical Greek myth about the creation of the olive tree. 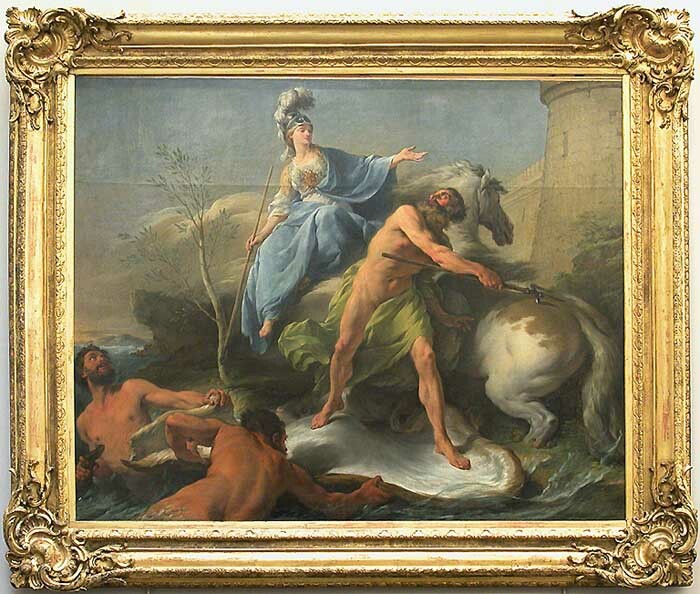 Poseidon and Athena both wished to be the patron deity of Athens. 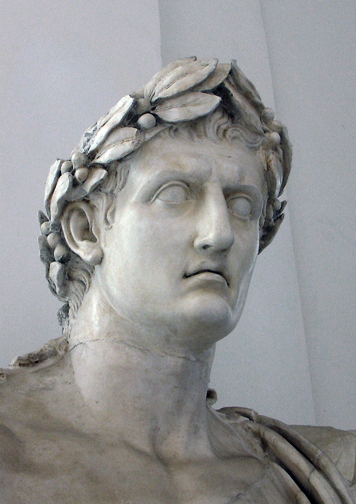 The dispute was becoming heated, but before it came to outright war, Athena proposed a contest: whichever deity could provide the most useful gift (as judged by Cecrops, the snake-bodied founder-king of Athens) would be the city’s special god. Poseidon presented his gift first. He raised his trident and brought it crashing down on the acropolis and a spring of water gushed into the air on the spot where the Erechtheion was later raised. The citizens were delighted—until they tasted the water and found it to be as salty as the ocean. Then Athena struck a great boulder with her lance. The rock split open and a beautiful tree with silver leaves grew in the spot—the first olive. Not only were the olives delicious, the oil was good for illumination, perfume, and cooking. The wood was made into votive statues and other useful things. The tree was drought resistant and tolerated brackish water. As always, Athena was victorious and the city was named in her honor. 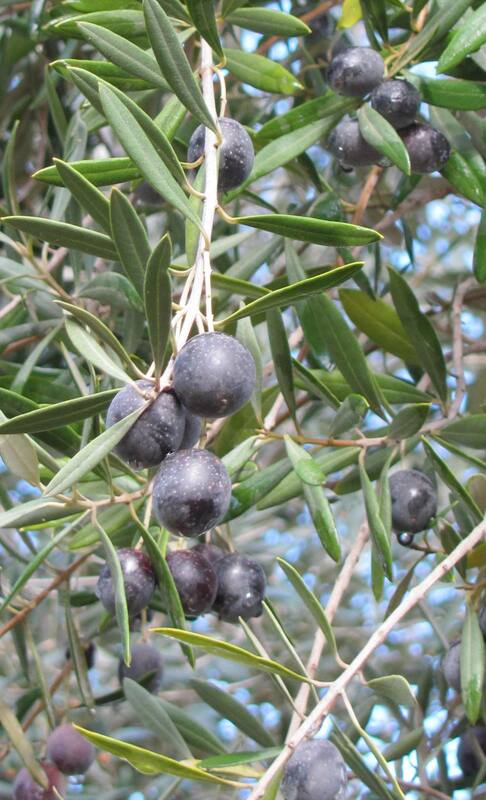 Wild olives (oleasters) were used for oil, fuel, and wood for at least 19,000 years. It is unclear when they were first domesticated, but domestication happened in many different times and places (possibly from different wild antecedents). Domesticated olives are propagated through grafting and cloning—since seeds can yield undesirable strains. As I discovered in San Francisco, ripe raw olives are so bitter as to be inedible—they must be treated with salt or lye (!) in order to become acceptable to the human palate (although goats and cattle do not object to untreated olives). The oil obtained from crushed olives was far more important than the fruit itself. Olive oil is almost pure fat and is resistant to spoilage for longer than a year. Not only was it the great preservative of classical society, it was the basis of cuisine, medicine, personal grooming, perfume, and sacred ritual. The oldest and most revered cult objects of ancient Greece, the mysterious xoana, were constructed of olive wood (although these strange sculptures were known to ancient authors, none have survived into modern times except as stone copies of the originals). In ancient Greece and Rome, victory—in games and in actual war–was denoted by a crown of wild olive leaves (also known as kotinos). Olive oil was equally sacred in the Levant where it played a part in Jewish sacrificial offering and priestly anointment. In the Bible, the olive is the first plant which the dove brings back to Noah as the flood resides—imagery which has become synonymous with peace. Ironically olive is also a dark yellow color (or a drab green) in universal usage by the militaries of the world thanks to the fact that it is not a color readily distinguished by human eyes and thus blends in with many sorts of terrain. In the modern world olives have spread from the Mediterranean and now live on all continents except for Antarctica. Huge orchards of commercial olives can be found not only in Spain, Italy, Turkey, Greece and Israel, but also in South America, Africa, Australia and Asia (and the West coast of North America, obviously). In their new homes olives can be a nuisance. They are a serious invasive hazard in Australia and certain Pacific Islands. Because of their resistance to drought, they out-compete native plants and create a weedy monoculture. Their high oil content makes them susceptible to fires which burn incredibly hot. Of course not all olive trees are commercial plants, or dangerous weeds. 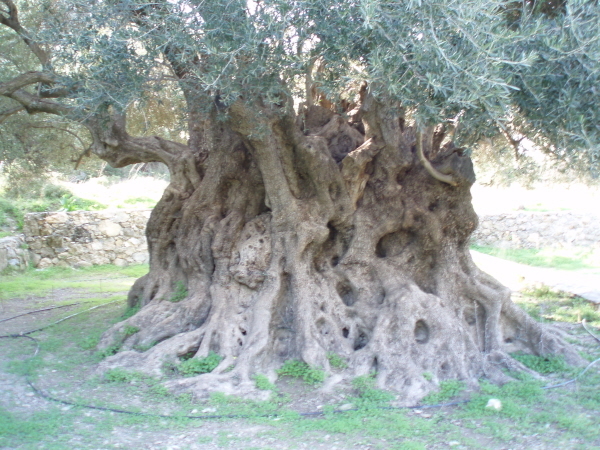 Olive trees can live to immense old age and some revered specimens are at least 2000 years old. Such ancient trees are remarkable for their fabulous gnarled trunks and branches which take on an otherworldly appearance appropriate to their age. Additionally it seems somehow appropriate that the olive tree—which has a reasonable claim to being humankind’s favorite tree–is capable of living through the millennia. Wow! I wonder what it feels like to stand in the presence of that 3,500 year old tree…. It certainly looks like it’s 3,500 years old. I would really love to visit Crete and see it. I would love to have a tree like that in my back yard. Even if it were young in comparison, I love the way the trunk looks almost like a lace of roots built up over time. I agree, but I am happy with the tree that actually is in my backyard. Thank you for pointing out the camouflaged tank in the center of the picture. I was looking for it on the left. 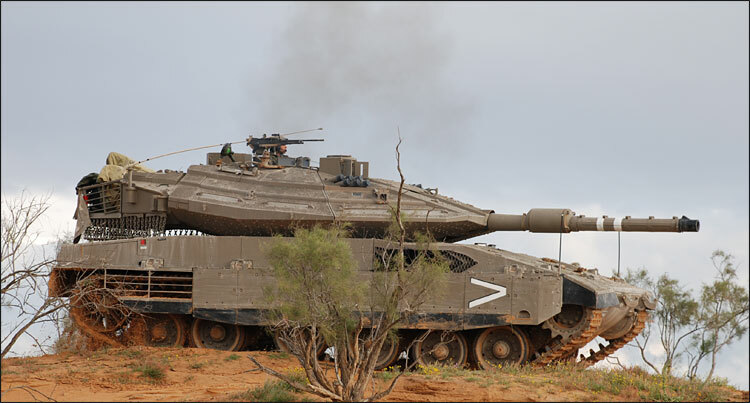 Camouflage can be tricky (particularly if the disguised object is hidden behind a tree–like the tank is in the picture above).